White Rabbit Chocolatiers opens shop in Paragon Arcade. White Rabbit Chocolatiers has opened a second outlet, in Hull’s Paragon Arcade. Popular artisan chocolate shop and café, White Rabbit Chocolatiers, has opened a second outlet in Hull’s Paragon Arcade. Part of a major re-development of the historic arcade being undertaken by the Allenby Commercial Ltd property development company, the shop will eventually feature a unique ‘Hull blend’ of delicious chocolate treats. The family team also have plans to add a micro kitchen, desserterie and workshop space – serving hot chocolates and chocolate desserts and hosting social events – in the new year. And they are recruiting for their ambitious new venture, looking for a new Paragon Store Manager to join the two additional members of staff they have already employed for the shop. This marks the latest leg of an ongoing expansion for the business, which was originally established 14 years ago by former teacher Sally Hawkes and is now run by her son Ed Hawkes and daughter Amy Fenner. Two years ago, they added a chocolate café to their main Beverley shop, in the town’s Dyer Lane, and have seen trade build dramatically ever since. Managing Director Ed Hawkes said: “Opening the Beverley café was the natural next step for us in the town. It was a brave move but we’ve been overwhelmed by how popular it’s become, with people travelling from across Yorkshire and beyond to visit us. “As a result, we’ve been hoping to build on this demand for a while, by opening another outlet, but wanted to wait until we found the perfect venue. 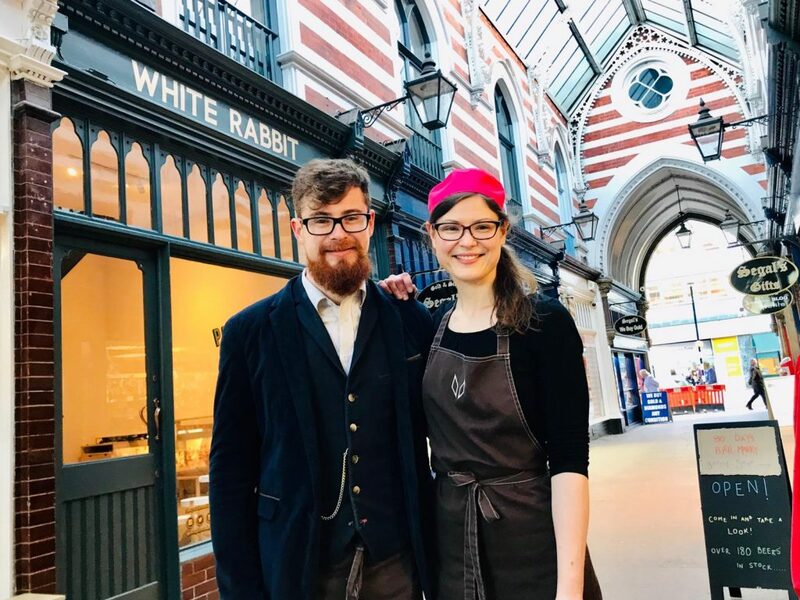 The new White Rabbit outlet is in Unit 6 of Paragon Arcade, nextdoor to Two Gingers Coffee House, and offers their popular range of exquisite chocolates, with plans to add a unique Hull blend to the mix in 2019. The site is currently undergoing a makeover to transform it into everyone’s vision of a magical chocolate shop ready for the Christmas build-up, in true White Rabbit style. “The arcade is going to have all the magic of a Victorian shopping street, it will look beautiful and it’s the perfect home for us,” added Ed. Their aspiration is to eventually produce much of the Hull shop’s chocolate on site, in authentic, traditional chocolatier-style. The shop will stage an official opening event on Friday 17 November, featuring entertainment, giveaways, chocolate tasting and discount. Anyone visiting the store should quote Whiterabbit2 to enjoy their special 10 per cent off until 30 November. Charlie Allenby, Allenby Commercial’s Contracts Manager, said: “As soon as we acquired Paragon Arcade in 2017 we embarked on a programme of improvements including a major renovation scheme and seven-days-a-week opening, and that continues. “A priority was to open up the first floor, much of which had not been used for years, and White Rabbit has joined other recent arrivals Marla’s Deli and 80 Days Bier Markt in making the most of that. White Rabbit Chocolatiers are on a mission to put East Yorkshire on the map for culinary excellence, and have won no less than 17 Great Taste Awards for their truffles and hot drinks, including a Great Taste Top 50 Foods Award in 2014, and two awards from the Academy of Chocolate. Their blackcurrant and juniper truffle earned them a prestigious 3 Star Great Taste Award and Golden Fork nomination in 2014 and continues to be their most popular flavour. They also boast a TripAdvisor Certificate of Excellence. Founder, Master Chocolatier Sally, trained at some of the most prestigious chocolate houses in the world to perfect her craft, including the Valrhona School in Burgundy, Westminster College in London and an internship at Vancouver’s Ecole Chocolat. Amy, who is gifted with a very sensitive palate, is carrying on that mantel, ably helped by talented team members like second Master Chocolatier Kathy Bates, who specialises in the decoration and colour work which make White Rabbit’s chocolate creations look so distinctive and beautiful. The family’s culinary inspiration stems from their idyllic rural past as part of a Northern Irish farming family. A family business with a 30-year heritage, Allenby Commercial has worked on a range of high-quality developments across the Yorkshire and Humber region. The company’s reputation as one of the region’s most trusted and innovative developers was reinforced by the acquisition of Danish Buildings, an historic property in the Old Town which includes the listed Bayles House and is being converted to provide office, studio and workshop space for young and old creatives. Other projects completed in recent years include the conversion of a former brewery to create The Maltings office development, rebuilding a Georgian property in Alfred Gelder Street to house Allenby’s own business and turning vacant units alongside Hull Minster into Hideout Apartment Hotel. Allenby Commercial is also modernising WORX in Beverley Road, Hull, and has welcomed new tenants including Mad Volume Climbing Springboard Nursery, Planet Gym and ARCO, the UK’s leading safety company. Be the first to comment on "White Rabbit Chocolatiers opens shop in Paragon Arcade."